BREAKING NEWS: Animals’ Angels Horse Slaughter Investigations Featured on National TV in Mexico! One of Mexico’s largest TV stations, Milenio Television, aired a strong anti horse slaughter piece. This is the first time that this issue is getting nationwide attention in Mexico, and the TV station just told us that the feedback has been incredible…The reporter specifically targeted the imports from the US and the cruelty exposed by AA at Southwest Livestock Auction as well as the Eagle Pass and Presidio export pens. Please share wide and far and like the article on the Milenio page! Mexico has become a major producer of horse meat in the world, but allegations documented by NGOs reveal the cruelty with which it transports and kills animals from the United States. Texas • As always, the trucks leave the pens just outside of Presidio very early and start driving on rural roads, raising large dust clouds that smell like fertilizer and diesel. The convoy is heading to the border of Mexico and will leave Southern Texas through the desert of Chihuahua. Within minutes, the transport truck will be parked at the gates of Ojinaga, where it will wait to receive the necessary documentation to make the crossing. But unlike other trailers that at this time are expected to move from one country to another with all types of products, sounds are coming from inside in trailer. You are hearing hooves against the metal. If you get to peek through the vents, you can see some close snouts to sniff the intruder. These horses are on the road to their death. They have been bought by Mexicans engaged in the production of horse meat for export, a controversial industry that Mexicans know little about and which critics say falls squarely within the realm of the cruel. Sonja Meadows, director of Animals Angels, another group pro animal, seconded: “We followed trucks loaded with up to 40 horses for over 36 hours and at no time the animals were given water or allowed to leave to rest (…) there is no excuse for the inhumane treatment “. Pringle and Meadows relate to a fairly new phenomenon that has led Mexico to become in about half a decade one of the world’s major producers of horse meat, second only to Argentina and Canada and above traditional production countries such as France and Holland. 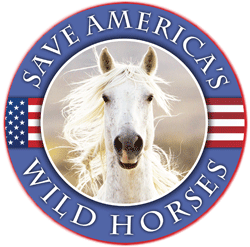 Since the U.S. government in 2007 banned the commercial killing of horses considering it an inhumane practice, the killing has increasingly migrated south. Thousands of horses are imported annually into Mexico for slaughter. According to data from the National Health Service, Food Safety and Quality (SENASICA) obtained via the Federal Transparency Act in five years 321,000 horses crossed the Rio Grande and ended up in one of the five plants that are authorized by the Secretariat of Agriculture, Livestock and Fisheries, located in Chihuahua, Zacatecas and Aguascalientes – On average, 175 horses are imported daily for slaughter. The trend is upward. Ojinaga and Presidio could be viewed as the epicenter of bi-national traffic of horses for slaughter. At the border shared by the two cities alone, 34,000 horses were crossed in 2012, with updated figures until November. Another 32, 000 crossed in Piedras Negras and Ciudad Juarez. Before crossing into Mexican territory, different buyers accumulate the horses at pens in El Paso, Eagle Pass and Presidio. According to the Department of Agriculture of the United States, the horses travel several thousand miles, from states as far away as Utah, Tennessee, Oklahoma and even Minnesota, at the Canadian border. In this part of southern Texas and northern Chihuahua the evidence of this flow of equine can easily be observed, both those arriving and those who leave. Inside the export pens, hundreds of animals are waiting to be loaded onto the trucks that go to Mexico. Some loaded trucks carry over 40 horses, the trailers will be sealed after the checkpoint where Sagarpa staff checks for infections or injuries. Once approved and crossed into Mexico, the horses are on a long ride that will take them by road to the plants of Camargo, Aguascalientes and Zacatecas. Along the way, it is sometimes possible to see the horses hold their heads high trying to get some air. On average, a horse can have up to 150 kilograms of meat, plus intestines for sausages, musical instrument strings and glue. But it is the consumption of horse meat itself where you enter a controversial issue openly. Many countries reject the idea on the basis that they are pets and not livestock raised for the specific purpose of being slaughtered. Furthermore, the drugs used to treat horses throughout their lives should not enter the food chain. “A horse is not a chicken or a cow. Drugs that are given to horses are serious risks to human health, “said Pringle, who noted that her organization has reason to suspect that among the huge amounts of horses exported from the U.S. to Mexico for slaughter, some have hazardous substances in their system. The debate over horse meat ends up being subjective. But Mexicans are usually not those who consume the meat. 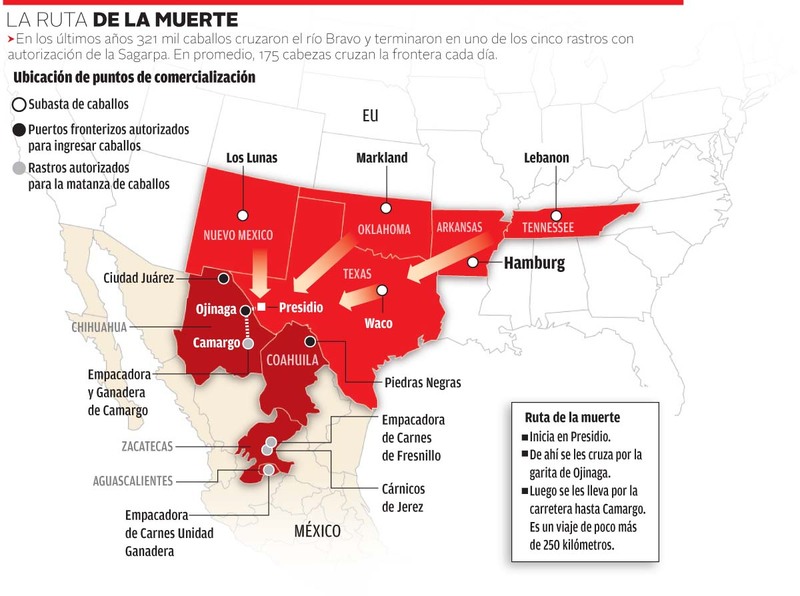 According to figures from the National Institute of Statistics, Geography and Informatics (INEGI), in about a decade equine slaughter in Mexico went from marginal activity-focused on a few consumers-to a multimillion dollar industry, but with a distinctly foreign market. 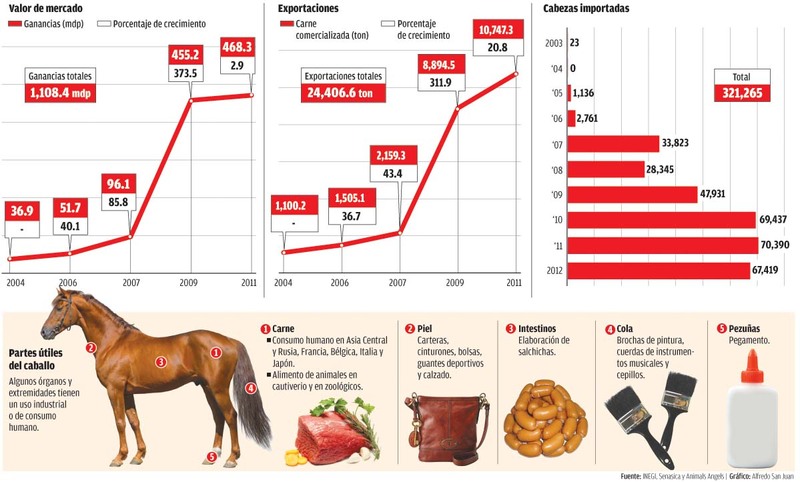 For example, the Foreign Trade Statistics Yearbook records that between 2009 and 2012, exports of “horse flesh” valued more than 1,700 million pesos were made to 13 countries on three continents. Buyers for the horse meat produced in Mexico have emerged in Belgium, France, Russia, Holland, Hong Kong, Italy, Japan, Sweden and even Swaziland, among them some of the few nations in the world who consume without taboo. It is a particularly high rise if you take into account that the industry did not exist before. Since 2004, the earnings of Mexican slaughter plan have grown 500 percent and are now close to 468 million pesos. Horse meat production for export has expanded into triple digits. For 2011, the figures reached a record high, with about 10,747 tons of meat produced, the bulk of which comes from the two plants in the Zacatecas area, located in Fresnillo and Jerez. It is one of the highest yields in the world, according to statistics from the United Nations Organization (FAO). At that rate, and without being a country where there is a significant consumption of horse meat, Mexico could become one of the world leaders in production before the end of the decade. But the rapid rise of this industry comes with high cost. While closing of the plants in the U.S. has brought unprecedented gains to those engaged in the business of horse slaughter in Mexico, animal welfare organizations have documented a long line of violations and abuses that open the question of whether these horses – even when the final destination is the slaughter plant-are suffering more than necessary. Our reporter saw first hand how, in Presidio, a truck from the export pens was parked in a lot for three hours, with an average temperature of 35 degrees. During that time, while preparing the export papers, it was possible to hear the horses kicking against the doors, without anyone near to provide water. One of many routes that have been dubbed by activists as the “Death Road”, begins about 400 kilometers north of the border with Chihuahua, in Los Lunas, New Mexico. Following the ban on horse slaughter in the United States, thousands of horses are taken to the Southwest Livestock Auction. Mexican and U.S. entrepreneurs attend every week to do business and buy animals whose final destination is the slaughter plant. Within the industry, they are known as “killer buyers” (buyers of death). The price for some of these horses is minimal, sometimes not even $ 5 per head, although there are lots of healthy, young foals whose market value could be 50 times that. After being sold, the horses begin a long journey marked by cruelty. MILLENNIUM had access to a series of videos recorded by hidden investigators from Animals’ Angels Inc., who in late 2012 documented several of these shipments bound for slaughter plants in Camargo, Fresnillo and Aguascalientes. The different videos show images of abuse, and drivers with sticks beating horses from the outside of the truck and leaving them sit in the open [roof trailers], despite the high desert temperatures. Inside a trailer there is a horse that falls and is crushed by his peers. In another, the animals are completely overcrowded, unable to move, covered with manure. Some have open sores, are bleeding or eye infections. A picture taken in a pen, showing a mare and a dead foal, side by side. Animals’ Angels Inc. has launched a campaign in Europe to expose the conditions under which Mexican horse meat is produced. “Our organization has worked in the field since 2007. We have conducted hundreds of investigations and are currently launching a campaign in Europe to raise awareness among consumers about the brutality and cruelty of this industry (..) “said Meadows. This is so horrific it makes me cry they do not deserve this kind of treatment they are our buddies friends and pets and this needs to stop NOW! Our American horses are not raised for meat and the meat is tainted when will this STOP! It’s impossible at this point to know who to blame for these horrendously cruel slaughter house practices. If there was a law against shipping and transporting from the United States that would possibly end the trail of blood from our country to Canada and Mexico; but it would not end what seems to be the very lucrative practice of selling horse meat for human consumption. I feel sick at heart knowing what is happening to these horses, not just in Mexico and Canada; but all over the world,in countries that consume horse meat. I think it is up to the Unites States to set some kind of example since we do not eat horse meat in this country. We need to stop the shipping and slaughter of American horses as soon as possible. The numbers just keep rising; and with Oklahoma passing their own law regarding rendering plants, we are going to see more states make their own laws regarding horse slaughter. This is not a state by state issue. This is a Federal issue and the government has to do something soon as the United States is now the largest exporter of horses to slaughter houses outside of our borders. Is this what we want our nation to be known for? If we respect these animals enough not to eat them, then we should respect them enough not to put them through this horror. I know that everyone on the site feels the same as I do and I am just preaching to the choir; but I keep asking myself what can be done? Great comment on issues…….your so right on everything…………..
A few weeks ago a commenter posted a video titled “The Path of the Horse.” Everyone involved in any way with the horse industry should be made to see this incredible one-hour movie by Stormy May, a “traditional” horse trainer, riding instructor, competition judge turned documentary filmmaker: http://www.youtube.com/watch?v=TQUMAJCh1fA. Horses, we discover along with Stormy as she takes her geographical and metaphysical journey, are sensitive, spiritual beings who are here to be our teachers. We can become their students — and better human beings — only as we stop “using” them for our purposes, stand quietly by their sides, and listen to them speak to us. Congress needs to pass The Safeguard American Food Exports Act of 2013 that will ensure that these majestic animals are treated with the respect they deserve. I pray this happens soon. S.A.F.E. is HR 1094 and S 541.
the only solution at this time is pass HR 1094 & S 541. Horse slaughter needs to be banned to stop the war on our American horses! Enough is enough! It is too bad the video is in Spanish. It is important to keep watching and keep abreast of these painful matters to inspire and to keep one wanting to do what is right and what must be done for our horses. You keep seeing the videos, you must keep on writing, petition, picketing, etc. If we must die for them if it comes down that. They have for centuries for us. It is so important that we keep in mind and keep this burden on our hear to keep going. This is good that this graphic video and others keep going viral. This will inspire and keep putting burdens on other people’s hearts. A translation is needed! I for one, would like to see it and hear the words, not this. I cannot speak for others those. You must see this stuff to never forget what we are fighting for. The horses saw this stuff everyday on battlefields and when they carried us on their backs through history, so why must we deny ourselves to watching this? Horses are part of our souls and we must suffer alongside of them. I know the drill…I could not read the piece because it is so distrubing. We must all keep the heat on the federal Legislators because they could stop the whole mess. I am disgusted and totaly disappointed in our current Legislators. They have ignored our pleas and our voices..Our reguests could save them money. I guess the “Blood Money” is worth more than our voices. Something must be coming down the pike because I have received very few Action Alerts as in the past. I pray every day for the Animal Angels because the work that they do is so sad but necessary. The burn out must be tremendous with all the horrific things that they see. What we have that is visable is only the tiip of the iceberg. The average person has no idea what these animals endure. It doesn’t matter where the slaughter house is located the pain and suffering is still the same. If these Morans supporting slaughter think that it will be any different, they are sadly mistaken. We must continue our fight until it is over…or will someone always try to violate the law or try changing it as we have seen in the last couple of years. R.T. thank you for posting this report. It is huge and seem to be growing in strength in Mexico. All who have comment, thank you. The translation of the video is in the link, please go to their site and comment or at least thank them for doing this important expose. YEAH! For those animal angels doing this dirty job with passion to save our horses.. Thank you for reporting on this subject! I pray that this horse abuse will end! I saw a bit of the video, just can not watch that it is so so distrurbing and our GOV. WANTS TO START THIS UP AGAIN??? WE need to STOP ALL OF IT NOW once and for all, I feel it is really coming to a head it is so much more out there for people to see who don’t have a clue!! I just wish here in the US would show a video of slaughtering horses here when they did years ago, cause it would have to be here we all know the excuse they give that here it would be more humane, but guess the folks for slaughter seem to foget that a lot of those places where closed down because of inhumane and santitary conditions where so bad!!!!!! GOT TO PUT IT ON NEWS NOW if someone can !!!!! Our voice for these horse’s needs to be loud and clear to be heard! This has to stop now!!! I wish all the pro-slaughter of horses both government and individuals could and would spend at least one month with a horse. They would find the horse so intelligent, so loving and caring toward individuals. My horses not only know their own name, but also know the names of their pasture mates. If I call out for example, Alice, and she decided not to come up to the fence, the other horses start pushing her up with their nose and encouraging her. If you haven’t guessed already, Alice is very shy and all the other horses support her. The dairy farmers that I am surrounded with could not believe how smart horses are. My horses got out of their fencing one day and of course when straight for the highway. The dairy farmer that lives across from me stopped traffic and called me because he didn’t know how to get them out of the road. My Angie, who is an appaloosa/Dutch Harness horse was in the middle of the road, swishing her tail and doing her dressage dance because with all the cars stopped, surely they were stopped to watch her. I told my neighbor I will go outside and call them. I started calling each one by name and sure enough they all came running. He then said, do you need me to help herd them back into the fence, no, I opened the gate and they are already in. The farmers reply was, “I didn’t know horses were that smart, I thought it took horses forever to train them to do anything. I assured, my neighbor that they also can think of a lot of things to do on their own. My neighbor then came up to see I could use his help fixing the fence and I showed him how smart the horses were. I asked them are you thirsty and all six of them nodded up and down in a “yes” answer. I then asked the horses if they were hungry and again they all nodded up and down. The dairy farmer was amazed. He ended up buying his grand-daughter a horse. I have already made arrangements with my Vet that when I go, my horses are to be euthanized and I have already paid for everything. My horses will never have another owner or the threat of slaughter. I believe all horse owners should put $2.00 away each and every day for emergency care for their horse to pay for Vet care or euthansia. My horses give me back more than $2.00 of pleasure. The same for the beautiful race horses, if they didn’t win, well you have the money for euthansia, never, ever put a horse through auction or the slaughter house. What a disgusting thing Horse Slaughter is. What if someone took Obama’s dog Bo, and drove the dog for 24 to 35 hours straight with no food or water and then repeatedly stabbed the dog slowly and beat it, hot prodded it until it was unable to move, then begin skinning the dog while it was still conscious, then grinded the dog up for frozen food to be sold. I wonder if Obama would still promote dog slaughter. The horses are like big dogs, however, more intelligent and easier to train. I thank the Animal Angel’s and Thankful that they have such a passion for all living creatures. I honestly, would not be able to endure what Animal Angel’s have to do, to expose the filth of the slaughter industry. The video is graphic, but MUST be watched. It’s like clicking on a map search for “he! !” and getting a birdseye view. Thank you Animal Angels ! People are good. When they see the suffering in the reality of the horse sllaughter industry, I have the deepest faith, they will all rise as we have and join to DEMAND the ban to transportation and slaughter of horses (I wish it were the world!!). Thank you Animals Angels for your untiring efforts. you are the brave amongst the brave. The other thing, Why, the H#ll is our government emotionally harrassing, terrorizing American citizens and promoting violence against the horse (a companion animal) when 80% of the American public does not want our horses to meet a senseless violent death in the slaughter house. Plus, the legislators and representatives are not representing the American people, they are representing foreign slaughter plants? Plus, our legislators want the American people to pay for this with our tax dollars, our land, our horses and our drinking water. I strongly recommend voting out any legislator that does not listen to what the American people want and that includes if they vote for horse slaughter. It is our land, our horses, our drinking water and our money. Let’s get a strong back-bone. I think Oklahoma and New Mexico needs to start planning to vote out all Governor’s, Representatives, and Senate members who voted for Horse Slaughter, they are not representing the citizens. Remember, the voter is the boss, get rid of them. Can we sue our government for emotional damages, pain and suffering against us and our horses, I wonder? I think a lot of us should get together and do this. We could get a whole lot of $$$ and save our horses this way and maybe, just maybe, shut down our government and re organize it. Count me in. This has to stop. No animal, even those raised for food and destined to be slaughtered, should have to endure cruelty of any kind. I know the meat industry will never cease, but it’s the least we can do to treat the animals as well as we can and make sure they are killed in the most humane way possible. I can’t imagine what type of person it would take to slaughter animals all day. It isn’t hard to think that they would be uncaring and might abuse or torture an animal. There is one thing we need to figure out – if we can stop this, what do we do with all the horses that will not be headed to Mexico or Canada? Animal Angels you who are on the front lines, thank you for showing us the horror that every horse in every truck goes through on the daily basis. The pain is beyond words. The agony is intense and we must make this clear to the whole world to stop horse slaughter. We know so many horses do not deserve this horrible fate. We must stop the abuse, the killing, the agony, the trauma, the barbaric torture of packed trucks, no water, no space. We must hold all accountable for all violations that are documented. So many horses have died in painful ways. Stop the abuse now. Stop the torture now. Stop horse slaughter now. Shut the killing horse pipeline down now. I am outraged. The facts and footage of all of the horrific horse slaughter abuses starting from the auction house traveling to feed lots, then the long trip to the slaughter house can be over looked. The horses ending at the slaughter house is their final horrific destination. I can’t image what horse deserves this painful treatment. Could all of this be considered humane? Oklahoma is so wrong for passing their bill to let slaughter houses in their state. Now the truth about horse slaughter is coming out on national television. For years horse slaughter has been hidden from the general public. Because the horse slaughter industry knows that it is wrong. It is digesting to treat horses this way and should be a crime. Sonja @ Animal’s Angels is amazing and is very smart at directing this information where it does the most good – the consumers! Until we make the purchasers of horse meat across the globe understand where it comes from and the agony it creates – the slaughter houses in Mexico and Canada will keep cranking away while the money pours in! The EU is the biggest consumer of horsemeat and most people are simply oblivious to the slaughter and the dangers of the meat; exposes like this will change buying habits. I loved your comment, I’m a horse lover since birth as my dad was a horse trainer. I remember wanting a pony all my childhood, so when I got a job I saved and bought my first pony. He taught me everything he had a beautiful head I started to love the Arab breed then. To make this short I bought my first purebred Arab horse in 1976, they were my best friends they knew I loved them and they loved me…I lost my husband tragically and I had 7 Arabs, I so miss them I hope someday I’ll get some of them back. They got good homes but I do miss there loving kind emotional heart, when I was upset or down I’d run to my barn to my babies they would always make me feel better, I know they knew…. when my favorite mare died my stallion cried for days he even licked her halter. So I took him to where she was buried he knew then. They have such love for there kind and for there owner’s. I feel privileged to have had my horses and how they loved me unconditionally…. What a great story about the stallion crying for his mare. They heal us from our troubles by being in their presence, riding them and connecting to them on a level so different than anything else. We just need the rest of the world who are unaware of the “UGLY” truth where they are headed as they hit the slaugther ride to HELL……. Since our government seems to be interested in only money, we should get advocates to pass a bill that would put a stiff tariff on transporting the horses to other countries. At the boarder, the trucks should be charges $100,000 per shipment and then tax the Mexican gov. $5000 per horse. If money speaks loudly, this would no longer be a lucrative business for kb and shippers and slaughter plants. Also, no horse should be allowed to go to slaughter under the age of one year. There has got to be a way to get this practice to end. We all need to work together for solutions to this terrible practice. Animals Angels will have even more work to do if/when the stupid slaughter houses open in Oklahoma. Please keep them in your prayers and help them if you can. Thank you. Thank you. Thank you! Brilliant for Europeans to be able to see the cruelty and suffering that is inherent in horse meat. They are supposed to be more civilized that those of us on this side of the pond. It is their “Meat Mafia” that is adulterating beef and chicken with horse meat and cramming it down their throats, so their awareness and rejection of this atrocity is the key to ending it. I am so proud that Animal Angels finally got footage of the animal abuse and torture our beloved horses go through to give them a tained meat they crave…hope it opened the Europein’s eyes to the disgusted of this act. I couldnt watch the video but could someone give me the just of it please? We need to stop this!!!!!!! The only way you could force any of the US Senate to put a stop to horse slaughter is to drag them kicking and screaming inside a horse slaughter plant and force them to watch the killing. I know that will never happen. But many of these politicians have seen the videos. Some years ago I believe it was Animals Angels, I’m not sure, but they made appointments to see many of these politicians in their offices. The way I understood it a number of the female politicians shed a few tears when they saw the cruelty and promised to work to stop it but none of them actually lifted a finger to even attempt to do one thing. This is what I and many other crusaders have been up against for years trying to stop the killing. Its just a shame these crooked politicians can’t be sent back to the Jurassic on a one way trip a few days before the meteor struck the wiped out the dinosaurs. Mexicans in general don’t eat horse meat. It’s Europeans Asians who eat it. They are starting to come out of the dark and realizing they eat toxic chemicals these horses were given. It’s time we stop feeding the world toxic horse meat.